The French Minister said that the problems between Russia and Georgia should be resolved through negotiations. “Dialogue is the only way to solve those problems,” he said at a meeting with the Georgian opposition, analysts and journalists. Kouchner presented parallels between Tbilisi-Moscow relations and the relations of Russia and Poland, saying that Moscow and Warsaw had had “tense relations”. “However when a plane crash took the lives of the Polish Government members, Russia and Poland came together and the Russian Government shared in the tragedy,” he noted. “Georgia should follow the example of Poland and the US and start a dialogue with Russia. The EU will help Georgia in this. I understand that after the war of 2008 this is hard for you to do, but it is necessary. Georgians should talk to Russians,” Kouchner added. He named the Geneva negotiations as a way to regulate relations between Tbilisi and Moscow. “The Geneva discussions should go on and within this format you should force Russia to fulfill the Medvedev-Sarkozy agreement,” Kouchner said. The French Foreign Minister called on the Georgian side to show patience. “I believe that Georgia’s territorial problems will be resolved through peaceful means, through negotiations, however a dialogue with Russia and some patience is needed,” he stated. “The most important thing is that there is no threat of a new conflict. I understand that you are impatient and want to resolve the problem soon, however two years is not such a long time. Resolving these kinds of conflicts needs much more time,” Kouchner said. Asked by a Georgian journalist whether France would use the term “occupation” to describe Russia’s actions in Georgia, Kouchner said that using the term “occupation” will not resolve the problems between the two countries. Civil society should play a “big role” in resolving Georgia’s territorial problems, Kouchner said, suggesting that holding festivals and restoring cultural links could be a way forward. “The best way to make people get together is to activate civil society. At the same time we can see that Georgia is moving forward, a lot of things are being done and this is the best way to make South Ossetia and Abkhazia want to live in a united Georgia,” the French diplomat noted. Kouchner called for the development of democracy in the country. “I cannot dictate democracy to you but you should walk towards it by yourselves. It is necessary that human rights and freedom of election, speech and media be defended in Georgia. In addition at least the elementary rights of the opposition should be upheld in your country,” the Minister noted. He suggested that the problems should be resolved “through political means”. “When a situation goes beyond the political process it gets more complicated and a solution is hard to find. The Georgian people should get involved in the elections more actively, because this is the best way to express one’s will,” Kouchner said. 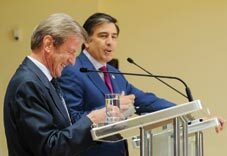 President Saakashvili assessed the visit and statements of the French Foreign Minister as “very important.” “We are old friends and it is symbolic that Bernard Kouchner is celebrating French Independence Day with us,” he noted. He stressed that several European delegations have been visiting Georgia throughout the week, saying that this indicates that “the country is continuing its democratic development.” Georgia will never renounce its EU and NATO aspirations, the Georgian President said. “This is not the decision of the Georgian Government alone. 70 percent of the Georgian population supports this idea. We live in a very complicated region but we empathise with European values,” Saakashvili said. Earlier on Thursday the French Foreign Minister had met opposition representatives. Issues related to Georgia’ internal situation and foreign policy and its human rights record were discussed, the opposition members said. Irakli Alasania of United Georgia-Free Democrats said that they informed Kouchner about the problems with democracy in Georgia. “We asked him to support Georgia becoming a really democratic and successful state. We asked France, as Georgia’s partner country, to assist in developing democratic institutions and creating a politically pluralistic environment,” Alasania said. “We told Kouchner that there is no democracy in Georgia and any talk about steps being taken to develop democracy here are delusional and self-deceiving,” Nino Burjanadze, leader of the Democratic Movement-United Georgia, said. “We told him that there are political prisoners in the country, and no independent court or media and we informed him that this could lead the country into a difficult situation,” she added.